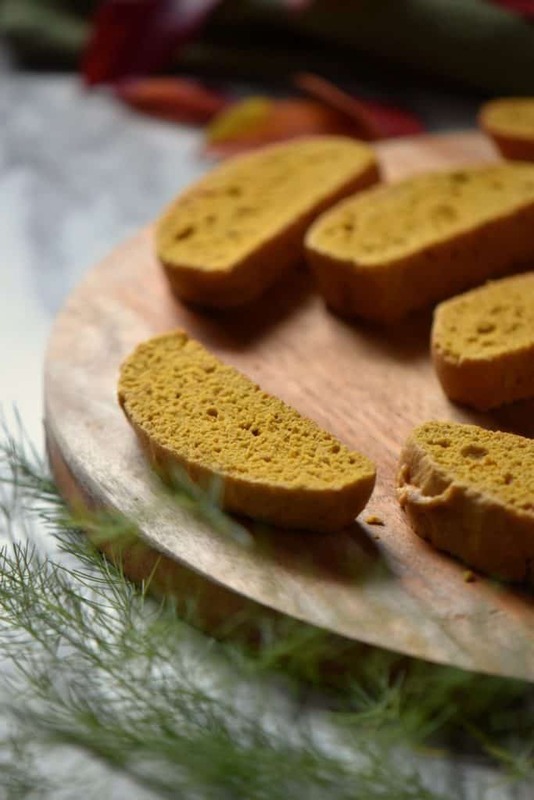 Home » Biscotti » Pumpkin Biscotti: All You Need is a Cup of Coffee! 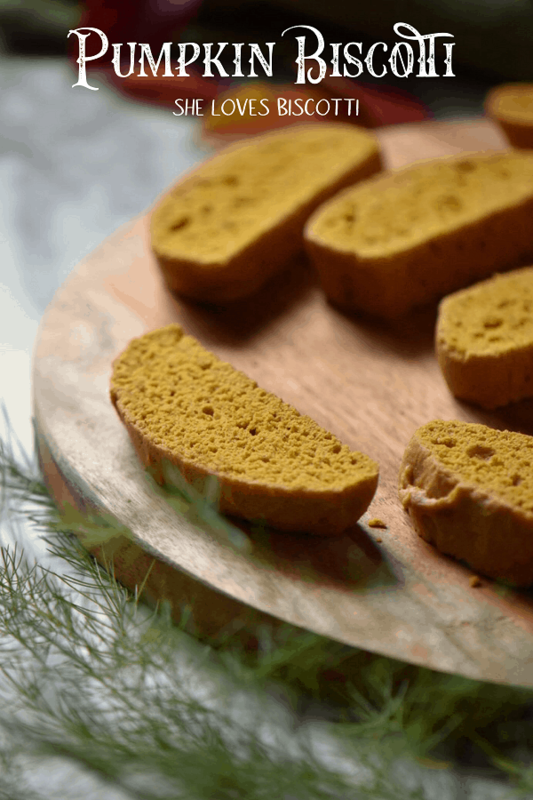 Pumpkin Biscotti: All You Need is a Cup of Coffee! Did you know that you can make biscotti into almost any flavor? If you like baking with fall spices, these pumpkin biscotti are for you! Your home will smell like pumpkin spice as they are baking in the oven! It’s fall, and pumpkin spice can be found everywhere! I’ve always enjoyed baking with these spicy and sweet spices that make up this blend -cinnamon, ginger, nutmeg, Allspice and cloves. In fact, I enjoy it so much that I made my own Pumpkin Spice blend! 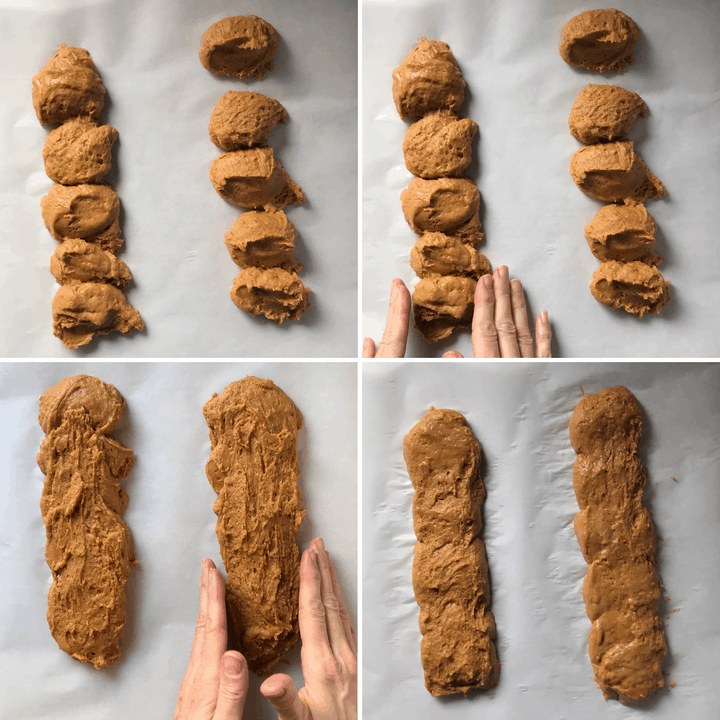 It’s been almost a year since I last shared this Thin Biscotti recipe with all of you. It was only a question of time before I would combine two of my favorite things together. 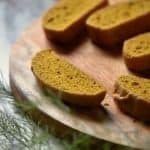 What do I need to make pumpkin biscotti? Flour. A combination of all purpose and whole wheat flour provides the perfect texture for this Italian biscuit. Baking Powder. Just the right amount for the perfect rise without the aftertaste. Pumpkin Spice. A homemade version, without any additives is always better. Eggs. Take your eggs out of the fridge at least 30 minutes prior to starting. Brown sugar. This provides a rich undertone. Pumpkin Puree. You can make your own or purchase canned pumpkin puree. Vegetable or canola oil. A neutral tasting oil works really well in this recipe. Vanilla extract. Pairs wonderfully with the pumpkin flavors. 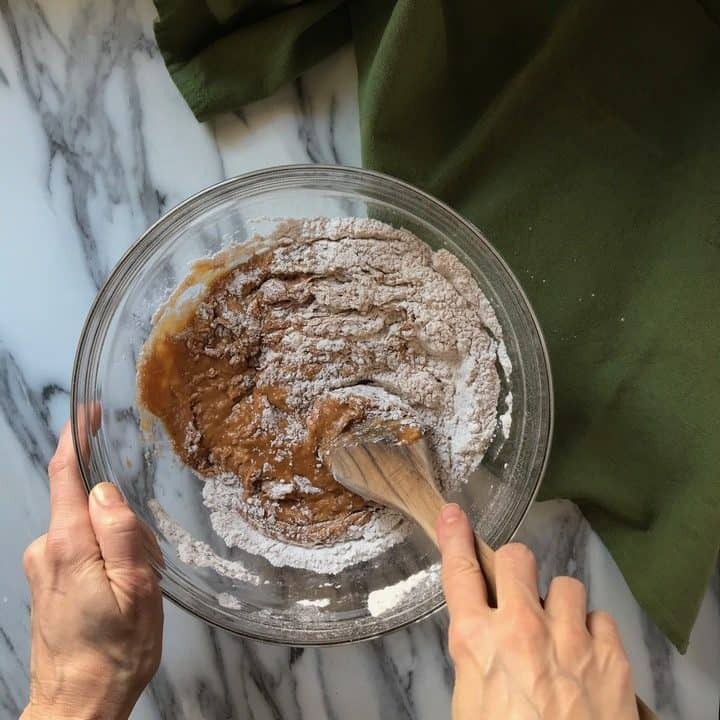 As far as accessories are concerned, you need two bowls to separately combine the dry and wet ingredients, as well as a whisk. You also need a cookie sheet covered with parchment paper. Finally, a cutting board and a sharp knife is required to properly slice these biscotti cookies. 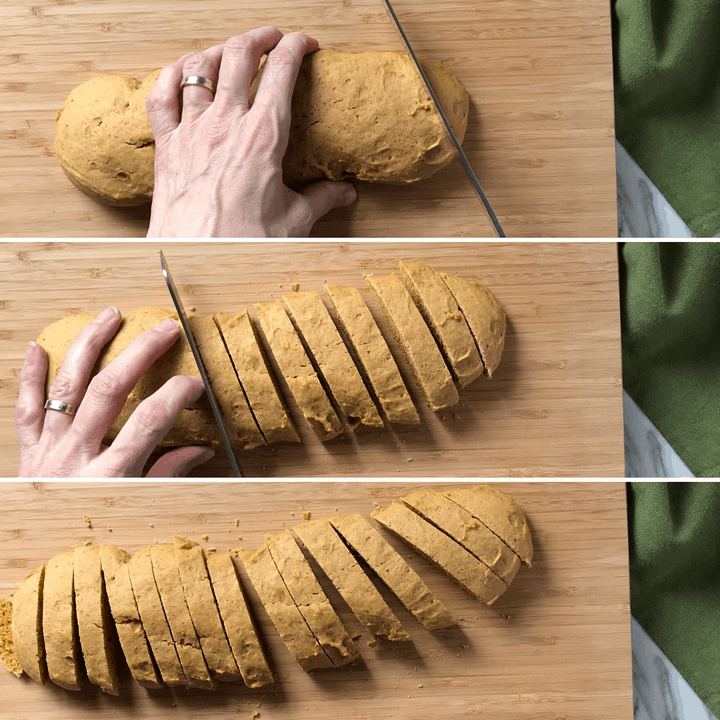 It’s now time to combine biscotti and pumpkin together… are you ready? In the first bowl, we are going to combine all of the dry ingredients. So, whisk together the all purpose and whole wheat flours, the baking powder and the pumpkin spices. Set it aside for just a minute. In the second bowl, whisk together the eggs with the brown sugar for a few minutes. Then add the pumpkin puree, canola or vegetable oil, and vanilla extract. Incorporate these ingredients by whisking for a minute or so. Add this wet mixture to the dry ingredients and mix with a wooden spoon only until the mixture comes together. With the help of a large spoon, scoop out the dough and place it on the parchment lined cookie sheet. Add another scoop adjacent to the batter on the cookie sheet and keep going until you form two logs. Then, moisten your fingers with just a little bit of water and shape into a log. Bake for approximately thirty minutes or until the top springs back when gently pressed. Remove from the oven and allow to cool down for at least ten minutes. Place on cutting board and with a sharp serrated knife, slice into ½-inch slices. 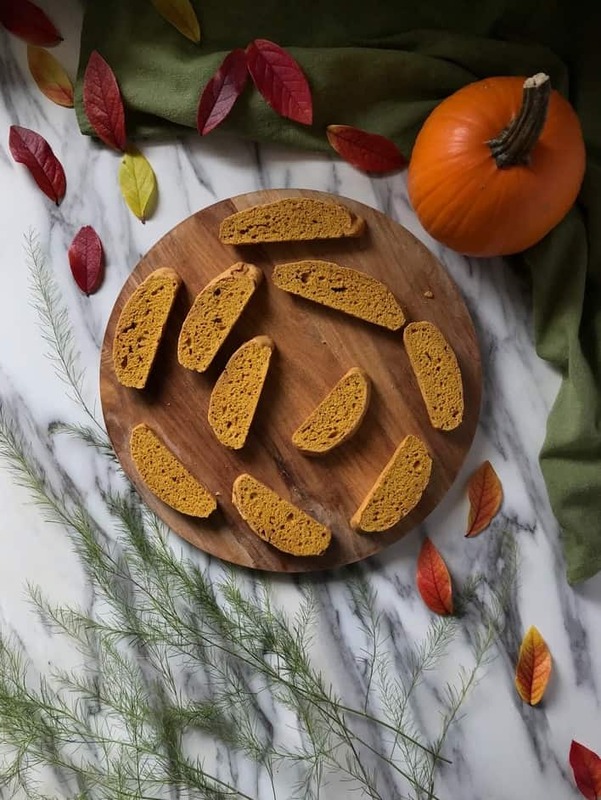 Place these sliced pumpkin spice biscotti back on the parchment lined baking sheet for a second bake. Bake for about 7-10 minutes before turning them over and baking for the same amount of time. Please note that the longer they stay in the oven, the crunchier and harder they get. There is no need to use a stand mixer with this recipe. Both the dry and wet ingredients come together very easily with a whisk. Once you remove the biscotti loaf from the oven, allow it to cool down for at least ten minutes before slicing into it. You can obtain a softer cookie by eliminating or reducing the time for the second bake. If desired, the pumpkin loaves can be sprinkled with turbinado sugar before the first bake. Can I add nuts to these pumpkin biscotti? Yes, you can add a handful of nuts, like roasted pepitas, seeds or chopped up dry fruit. You probably already know that I love biscotti. Be sure to look at my collection of Biscotti Recipes to be convinced! I enjoy the versatility of this simple Italian cookie, and the fact that they are great to dunk in your coffee. 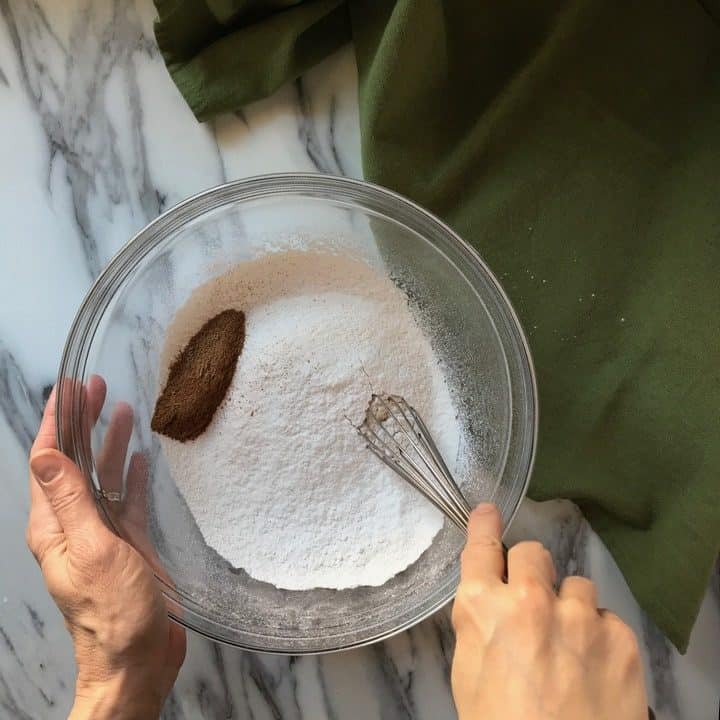 I’ve done a lot of experimentation with different flavors over the years and often times, I will use my mom’s recipe for Almond Biscotti as a base. 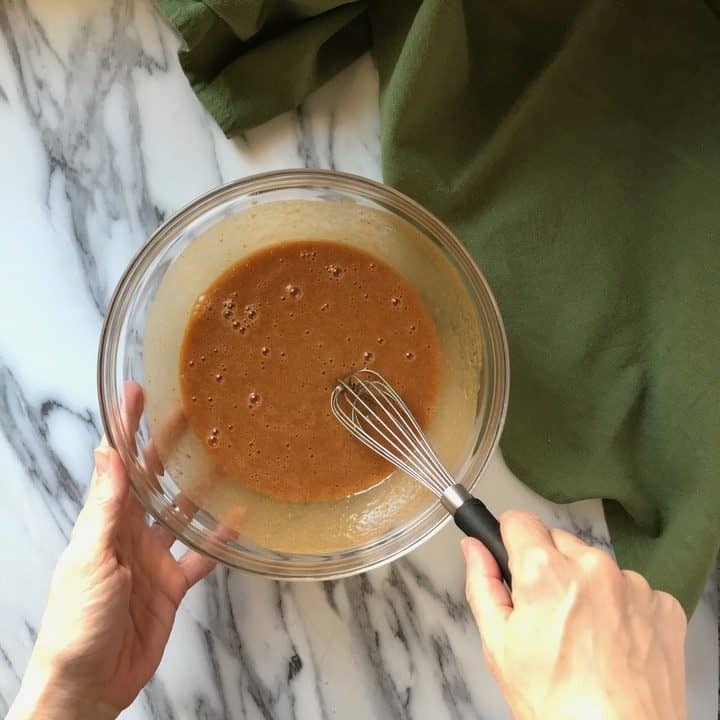 In order to accommodate for the pumpkin puree, which is essentially a “wet” ingredient, I decreased the amount of eggs and total amount of oil. A neutral oil (canola) was used instead of olive oil as this was a better combination with the pumpkin spice. Half of the regular all purpose flour was replaced with whole wheat flour. Granulated sugar was replaced with brown sugar. The almond extract was eliminated and the vanilla extract was increased. 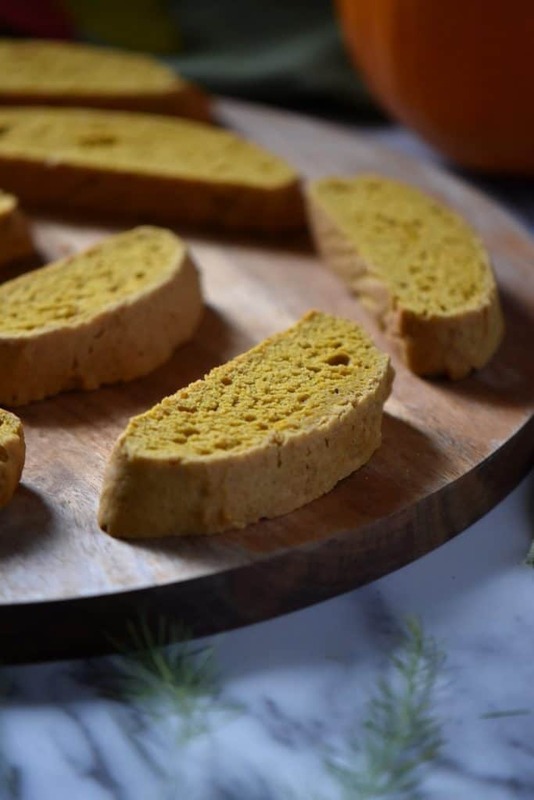 These pumpkin biscotti will provide you with a crunchy and crispy exterior, with a touch of softness in the middle. 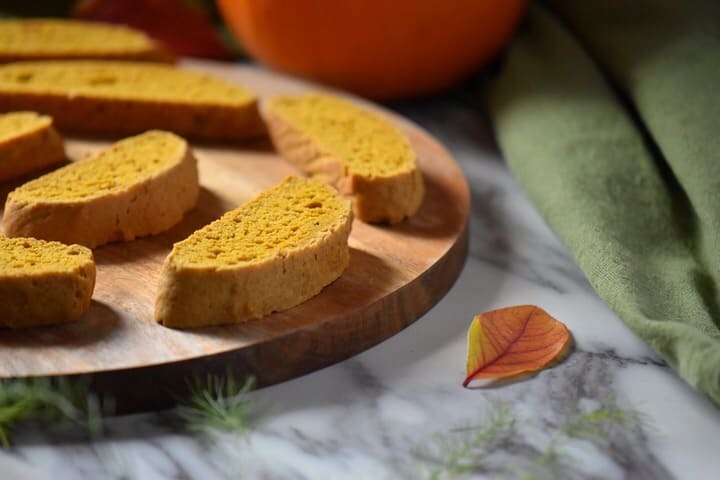 ★★★★★ If you have made this Pumpkin Biscotti recipe, I would love to hear about it in the comments below and be sure to rate the recipe! If you like baking with fall spices, these pumpkin biscotti are for you! Your home will smell like pumpkin spice as they are baking in the oven! Preheat oven to 325° F. Position rack in the center. In another bowl, whisk together eggs and brown sugar for a few minutes. Add the pumpkin puree, oil, vanilla extract, and whisk together for another minute or so. Add the liquid ingredients to the dry ingredients; stir with wooden spoon until just incorporated. Use a large spoon to scoop out the dough and place it on the parchment lined cookie sheet. Add another scoop adjacent to the batter on the cookie sheet and keep going until two logs are formed. With damp fingers, shape into a log shape. Bake for approximately 30 minutes or until golden brown in color and firm to the touch. Allow to cool slightly for about 10 minutes. Remove from baking sheet and transfer to cutting board. Place slices back on the baking sheets, and return them to the oven for about another 15-20 minutes (the longer they stay in the oven, the crispier they get). Turn them over at the half way mark. I prefer to use my own Pumpkin Spice blend as the commercially prepared blend will often have sulfites. A handful of nuts, like roasted pepitas, seeds or chopped up dry fruit can be added to the mixture. Thank you Maria for a super recipe. I used it to make a cake by lowering the oven temperature and skipping the slicing and toasting, as I was making it to take for tea with some neighbours! They lived it. But I also made a new recipe with thesebguidelines. As I have to control my sugar and white flour intake, I made breakfast flapjacks by reducing the oil, 1 tbsp sugar only and substituting white flour (used just 1/8th) with oats, and adding milk. They came out super. A tiny drizzle of honey on top of the hot flapjack was the cherry on the cake. Am greatly inspired to try your other recipes too. Thanks again. These are just too adorable (and I easily guess, pretty good!) No, I didn’t know you can have biscotti with any flavor! And I definitely love the pumpkin and spice flavor of these ones. Another great recipe, Maria!